When manufacturing custom cable, there is an array of options and specific choices that must be made. One of these choices is the Filler Materials for Custom Cables and understanding the filler that will be ideal for your product. Developing custom cable capable of handling your industry’s specific needs, increasing efficiency and maximizing budgets. Between the wires housed in your cable assembly, there is typically a filler material helping to keep these wires in place and ensure that the cable stays round in cross-section. This filler can vary greatly in material ranging from foam substances to plastics to aramid fibers, and all of these materials have differing properties that they can impart on your custom assemblies. Fillers have several functions within a cord including helping the cord to retain its shape and reducing friction and heat which can degrade your wiring over time. There are several available Filler Materials for Custom Cables that can be utilized within your cabling to reduce these adverse reactions and increase the lifespan of your product. Your manufacturer may choose to utilize tape to hold various wires together to make the manufacturing process simpler. This can prevent tangled wiring by keeping all of the cable’s necessary wires together before incorporating it into a cable assembly. Tape is also an effective filler material for expelling any air pockets that may have been trapped between the various wires housed within the cabling. Many cable manufacturers also use tape to bundle the wiring together to form the desired shape. This is beneficial as some applications may require a thin, flat cord while others may benefit from a cable with a perfectly rounded circumference. Tapes can also be used to create separate groups of wires within the same cable. This is can help processing the cable and making attaching components easier. Polyimide tape: This type of tape can be used in high temperature applications and would be a helpful addition to assembly cabling that will be required to handle high-temperatures. 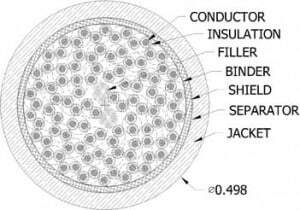 Water-swelling tape: This is a filler that will swell to offer an additional line of protection to the conductors held inside of the jacketing in case it is damaged, leaving the tape as the only barrier to protect the conductor. While a material like this may cost more initially, it has the potential to save your wiring system from shorts and water damage. PTFE tape: This type of tape is also well suited for high heat and high friction uses. It is very durable and can withstand industrial applications. If your wire will be used in a rugged environment, ask your manufacturer if this type of tape would be an effective option for your cable’s wiring. Polyethylene: This type of thermoplastic can be molded fairly easily and because it’s relatively light, it is useful for longer cables. Foam Fillers: Foam fillers can be made out of a variety of materials and are effective for filling in small spaces between wires and retaining the cable’s shape. Cotton: This is a low-cost solution which could be a benefit when creating long strands of wiring that will not require extreme durability. Cotton can be an effective filler for cords that need to be flexible as the cotton is not as restrictive as plastic fillers. Additives, such as flame retardant additives, can be used to customize this solution to tailor the wiring to your product and its needs. Steel: This filler can be used when strength is needed. It can be “tied off” at either end of an assembly thereby transferring any force the cable encounters away from the conductors and onto a housing or structure inside the assembly. Cabling that doesn’t need to have additional strength added to it can sometimes do without an additional filler. Cables with just a few internal wires may be able to forgo fillers and the extra protection that they offer if the wires are static in use and will not be exposed to bending, cycling or extreme conditions like water, chemicals, signal interference, or heat. Another factor to consider is the arrangement and geometry of your wiring system. Concentric and compacted strands likely don’t need to have fillers added to help them to retain their shape, but wiring with rope strand or sector conductor arrangements will not form a circular wire without the addition of fillers. Custom cable assemblies and custom cables often require fillers to ensure that they are able to work as effectively as possible and are protected from the elements and other stressors that they may encounter. Not all cables require fillers though, and they can alter the price of the final cable product. As a cable customer, it’s important that you understand what type of filler, if any, will be necessary to properly handle the needs of your cable and the wiring housed within it.